Now there’s a really unique bird: the Crete Guinea Fowl! This breed became very popular in aviculture due to its characteristics. 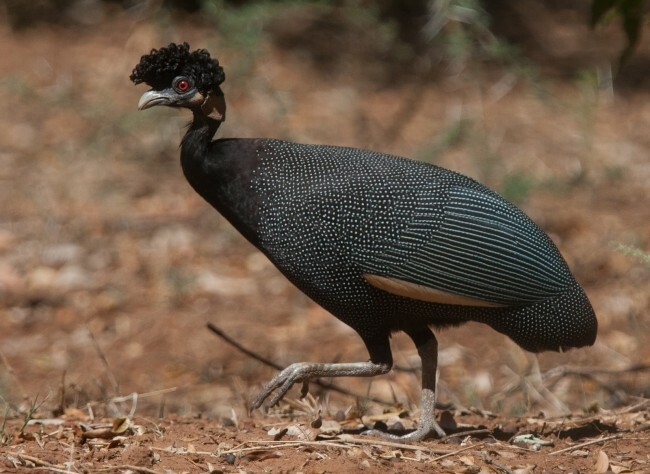 The Crested Guinea Fowl usually eat insects and only small bits of vegetation which they look for and find on the ground when they are in the wild. These birds travel in flocks having around twenty members, but winter finds them in pairs, set for breeding and nesting. During warmer month they rejoin the flock. They are not excellent flyers, so they will prefer defending by kicking or just retreating into trees, instead of just flying away. Less noisy than other domestic birds, the Crested Guinea Fowl are best kept in groups, in order to help with their shyness and lack of docility. These traits make this breed a bit of a nuisance. When feeding, the Crested Guineas make some soft noises resembling to some extend to chuckling. They rarely turn to alarm calls, but when they do, they are loud and somehow rattling. The crowns of these birds have curly, dark feathers. 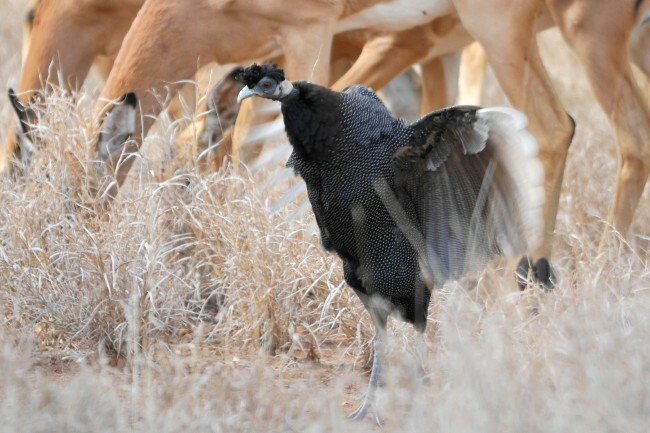 The Crested Guinea Fowl’s large and plumpish bodies are dark brown with gray shades or they are chestnut colored. They also feature some white spots with a black outline which speckle their entire bodies. Compared to the bodies, the necks and heads of the Crested Guinea Fowl are a bit small. The neck is bare skinned and bears blue as color, while the areas around the eyes and chin are red. Looking at a single feather of this bird, two different color patterns can be observed. While one half is striped, the other is white dotted solid brown. 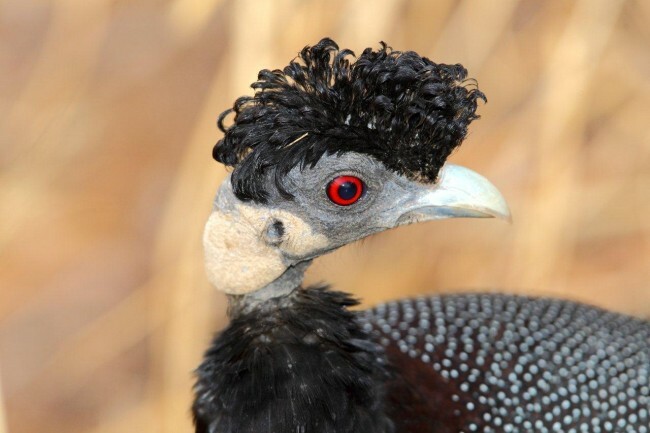 Many people prefer to go for breeding the Crested Guinea Fowl in captivity and despite the high level of popularity this breed won over time, there are still a lot of them still living out there, in the wild. Mostly, these birds can be localized in the Tumbatu and Zanzibar islands in Africa. But it is not only here that they can be found, also living in the continental side of Africa, in Somalia, Kenya and the north-eastern parts of Tanzania. 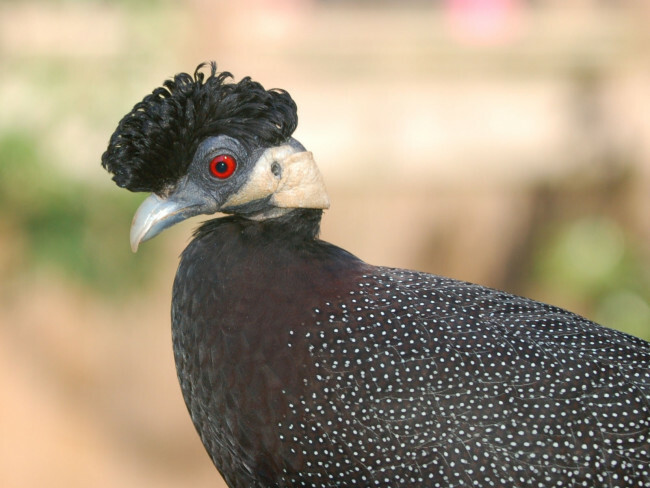 Because of their difficult nature, the Crested Guinea Fowl is easier to breed either in mated pairs or in groups. It was seen before that they can get along with other bird species occasionally. Despite them being reserved, they are still sociable birds and should not be kept isolated. Chicken crumbles, along with fresh greens represent an ideal diet for this breed. 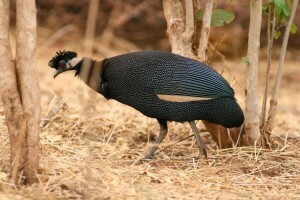 The Crested Guinea Fowl will also enjoy occasional crickets, fruits and super-worms. As a special meal, dog food can be fed to them, but only if it has a low fat level. 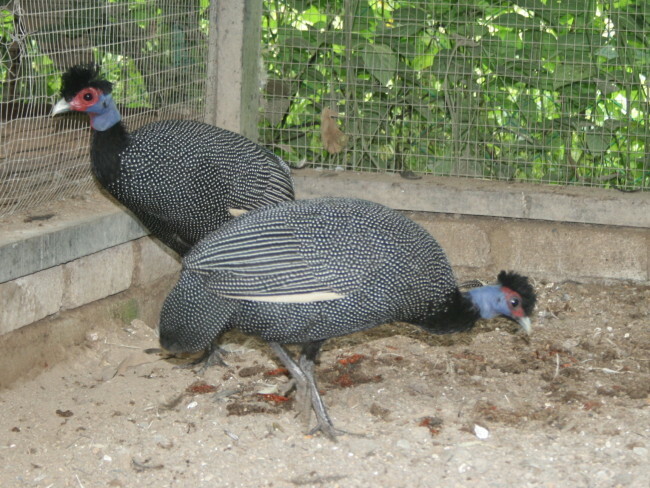 Monogamy is defining the Crested Guinea Fowl. Depending on the location they live in, the mating season can be any time between April and December. These birds can lay up to ten eggs, but most often there will be only 3 or 4 eggs, colored in cream and brown speckles. The chicks are a bit different in looks than the Crested Guinea Fowl adults, presenting white stripes across the neck and a browner body color.